AVIN AVANT 2 - Haven't drove my car in 3 weeks. Avin unit was having no issues last time I drove it. Now today, it reboots every minute or two. Any ideas? I tried a hard reset, and a system factor reset in the menu. Last edited by phillipjfry; 04-11-2019 at 05:45 PM. GPS is done. Avin does not support the Avant 2 anymore, and will not fix the issue. You can disconnect the GPS antenna, and reset. It should be a work around to get the unit working, minus the GPS. Indeed, premium price and the customer support goes kapoof. Though I'm not sure what a fix to the GPS rollover would entail. Well pulling the GPS antenna, and reboot worked. Although I did break every one of the retainer clips for the trim.. 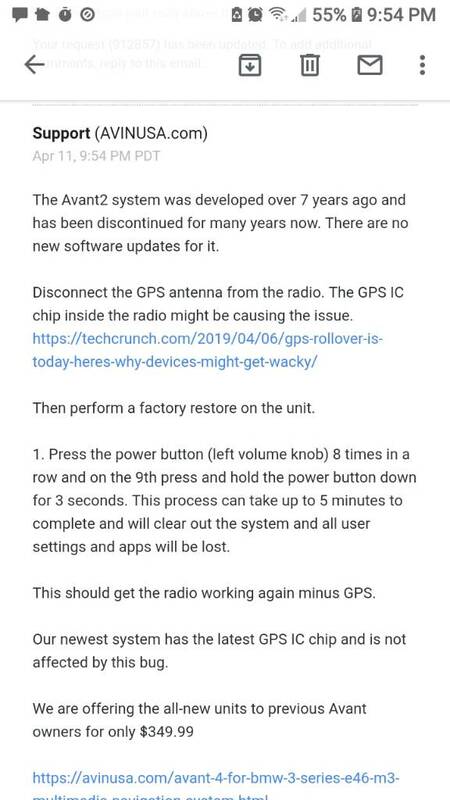 Honestly, I never even used the GPS, or any of the other crap the Avant 2 did. Only bluetooth, date/time, and the CD player is the stuff I use.